Splits the 12v in car power source four ways. Two USB sockets for portable electronics. 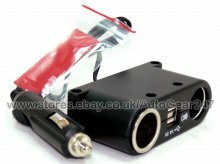 Two 12v sockets including one high current socket for cigarette lighter use. Brand new in a Sealed Pack.